According to canon law, visits to the cemetery at Easter day were forbidden. For this, there is a special holiday Radonitsa. Radonitsa is celebrated on the 9th day after Easter. Easter commemoration of the diseased takes place on Tuesday of Thomas week. People come to the cemetery to "exchange a triple kiss" and share the holiday meal with their dead relatives and friends. Orthodoxy brought in a new meaning to the ancient rite of spring funeral feasts. Jesus, having died for sinners and arisen, has given a new life to everyone – dead and alive. The name of the holiday comes from the word "radost" (joy), that was brought by Jesus Resurrection. This day is meant to share joy and hope for the universal forgiveness and resurrection. The ceremonial dishes such as fast funeral kutia, painted eggs, kulichi, pancakes, dracheni, honey prianiki and cookies are a must on the holiday table. The funeral table is decorated with a fir twig to the memory of a dead person there is an empty place, a setting and a candle. After the funerals feast an egg, a piece of kulich and cookies are left on the grave. The beggars are endowed with handouts. In the Rus the youth waited for Krasnaya Gorka (folk name of Radonitsa) with impatience. People sang and danced in a ring on beautiful green hillocks. Radonitsa days were considered the best marriage time. It was believed that people, got married at that period, would live well and happily. That is why young women accepted the proposals from men with optimism and enthusiasm. 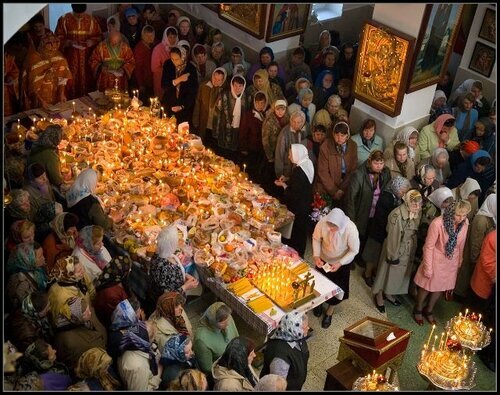 There was another beautiful tradition of this time – daughters-in-laws and sons-in-law endowed their relatives given by God with different gifts.Radonitsa comes to every house, bringing joy to the hearts and rewarding everyone with spring merry communication with each other and dead relatives. The time of rejoicing unites the hearts of believers and the hope for the best times is born.